Seventy-five procurement practitioners nominated by their institutions to attend CIPS Level 2 back-to-back Introductory Certificate training in Public Procurement have completed nearly two weeks of intensive classroom exercises held in the facility of Liberia Chamber of Commerce, near the headquarters of Liberia National Police in Monrovia. The training was disintegrated into two sessions to accommodate all invited participants. 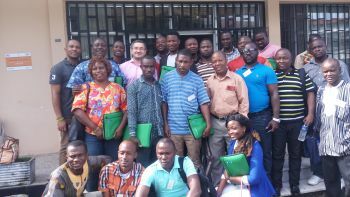 33 persons drawn from Monrovia based institutions attended Session One of the training, from September 20-23, 2016. The second session enrolled 42 participants who were mostly from county based institutions. This session was held from September 27-30, 2016. Addressing participants at the start of session two, Public Procurement and Concessions Commission’s (PPCC) Chief Executive Officer, James Dorbor Jallah, provided insights about the training and its attaining benefits to the participants as well as the procurement reform program of Liberia. He told the enthusiastic participants that the training is an initiative of PPCC organized in partnership with United Nations Development Programm(UNDP) to address the capacity deficit in the field of public procurement and prepare Liberia’s public sector procurement staff to qualify for a dual UNDP/CIPS Accredited Level 2 Certificate in Purchasing and Supply. Mr. Jallah said PPCC will remain engaged with UNDP and seek all necessary funding to build capacity of public sector actors in public procurement. “PPCC will continue to work with you to qualify you for the final level which leads to award of a dual UNDP/CIPS Accredited Certificate in Purchasing and Supply”. He indicated that unless a participant falls short of meeting the minimum requirements to qualify for the next levels of the course, PPCC will continue to underwrite cost of training for participants up to the point of completion. Mr. Jallah urged participants to take advantage of the opportunity to strengthen their knowledge in public procurement, with the ultimate objective of becoming procurement professionals. Two other officials from UNDP and Ministry of Finance and Development Planning, also spoke at the occasion. Mr. Cleophas Torori, UNDP Deputy Country Director for Programs, acknowledged the good works of PPCC in bringing the much anticipated changes in public procurement. He pledged his institution’s continued support to the capacity building initiatives of PPCC. Also, the Assistant Minister for Regional and Sectorial Planning of Ministry of Finance and Development Planning, Mr. Anthony Myers, challenged the participants to avail themselves to the opportunity and increase their knowledge in public procurement. He thanked PPCC and UNDP for the training initiative which he said supports the Agenda for Transformation (AfT).